This page contains details of the standard accessories that we stock together with the spare parts available for the Clearvue Cyclone products. Come back to this page often as we hope to add more and more accessories both from Clearvue Cyclones and locally sourced. Feel free to contact us with any ideas you have of products that you think would be useful. 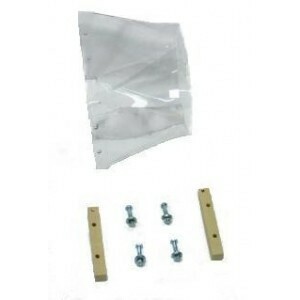 The information is arranged into two sections firstly Accessories and then Spare Parts . The prices shown on this page do not include the cost of packing and shipping the item to you. If you order accessories or spare parts at the same time as a system, it is often possible to package the items together with the system without increasing the freight costs. If you order more than one item we will always attempt to package them together to minimise freight or postage costs. For an explanation of how freight pricing works, please see the Australian freight section on the Pricing page. This genuine Clearvue Cyclone Product is a superior quality 150 mm blast gate which is injection molded. It features positive stops for the slide and pipe and has automatic tensioning for the slide to keep it in place. The gates are self cleaning. This Product is ideally suited to situations where you already have a blast gate but need 2 x 100 mm hoses for one machine. Simply slip 100 mm hose onto the outside and screw it down. This Product is ideally suited to situations where you may or may not have a blast gate but need 2 x 100 mm hoses for one machine and wish to control those two inlets separately. Simply slip 100 mm hose onto the outside and screw it down. This Product is a very high quality hose with clear PVC walls which are wire re-inforced to keep its shape and avoid crushing on bends. It is sold by the metre. This Product is a superior hose clamp for fastening 100 mm Flexible hose to pipes, gates or outlets. It is designed to bridge two corrugations of the hose. This Product is a superior hose clamp for fastening 150 mm Flexible hose to pipes, gates or outlets. It is designed to bridge two corrugations of the hose. This Product is only required if you use filters with your cyclone and configure your installation in the conventional way. It provides the link from the cyclone blower housing outlet to the filter stack. The unit comes flat packed with mdf side and mounting pieces and 2 pieces of PETG plastic for the top and bottom together with fasteners. If you purchase filters with your system this item is included in the system price. 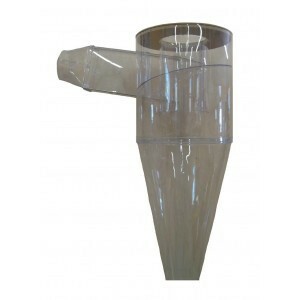 This filter is manufactured by Wynn Environmental specifically for ClearVue Cyclones. The MERV rating is 15 with an efficiency of 99.99% at 0.5 micron. It has a total area of 300 sq feet or 27.9 sq metres. A clamp is included with any purchase of 2 filters. You need to use a pair of filters or you risk increasing the back pressure on the system which will reduce the extraction efficiency. This Product is only required if you use filters with your cyclone and configure your installation in the conventional way. It provides the means of collecting the tiny amount of dust that is captured by the filters when you shake the filter stack periodically. 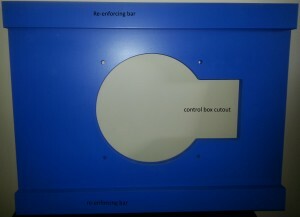 It is constructed of an mdf base and top with PETG sides and fitted with a vacuum hose connector. Manufactured by Dylos this diagnostic tool is used to measure and monitor particulate levels in your workshop. It is designed using technology that allows for real-time monitoring of indoor environments. The back-lit LCD screen displays a variety of particulate sizes and also a dynamic bar graph. Multiple mode settings are provided which allow data collection by minute, hour or day. The monitor evaluates air quality at the times decided with a storage of up to 30 days data. The unit comes complete with the motor plate to suit the Teco motor. It comprises an MDF top and bottom, PETG sides, bolts and nuts to form the body together with the MDF motor plate and 8 clips to secure the plate. It does not include the impeller which must be ordered separately.. This product is supplied complete with the required taper bushing to suit the Teco motor. It is factory balanced. Because it is a welded product there may be some slight visual wobble which is normal. WARNING! Never attempt to run an impeller that is not completely mounted in the cyclone assembly as serious injury or even death could occur! The CVMAX cyclone body is a 457 mm (18″) PETG plastic cyclone with an MDF mounting board at the top to allow fastening to a blower housing. It features an air intake transition from 203 mm (8″) round ducting to the square section at the cyclone body. For more information about the cyclone body see the CVMAX page. If you are using PVC duct in Australia it is likely that you will have had to use 225 mm (8.6″) pipe as 200 mm is not often available. In this case you will need a transistion to reduce the pipe without providing a blockage point. The CV1800 cyclone body is a 457 mm (18″) PETG plastic cyclone with an MDF mounting board at the top to allow fastening to a blower housing. It features an air intake transition from 152 mm (6″) round ducting to the square section at the cyclone body. For more information about the cyclone body see the CV1800 page. This product provides a smooth transition from the rectangular outlet of the impeller housing to a circular 203 mm (8″) outlet. This is used if you do not have filters on your machine. It comes complete with the wooden blocks and fixing screws. If you buy a system from us and do not order filters we supply one of these as a standard inclusion. This is the plate on which the entire weight of the cyclone and motor hang. It is re-enforced to provide sufficient strength.